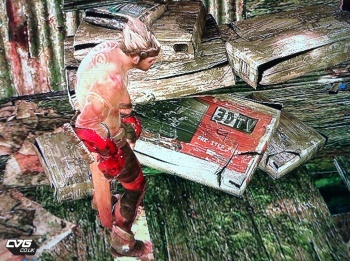 The designers at Ninja Theory poked fun at the fad of 3D televisions with some in-game humor in Enslaved. 150 years in the future, when New York City is an overgrown jungle ruled by despotic robots and humans are struggling to survive, 3D imaging is pretty useless technology. At least that what the characters in Ninja Theory's Enslaved think. Monkey, acted and voiced by LOTR's Andy Serkis, happens upon a ruined cardboard box proclaiming that 3D TVs are "One Step Forward." Monkey asks, "What is this stuff?" and his gadgeteer companion Trip replies, "Old jettisoned, irrelevant technology." Even though Ninja Theory is lobbing the obvious zinger at the current fad of every piece of entertainment being released in 3D from classics like the original Star Wars films to teenie-bop dance flick Step Up 3D, the company isn't abandoning all of its games to the 2D junkpile. Studio head Tameem Antoniades would just rather focus on story and gameplay than graphical trickery. "I haven't tried it out so I don't really know how well it works, I need to get my hands on it first and just see how it works," he said. "You can choose to lead or you can choose to follow and sometimes you want to lead and sometimes you want to follow. Our focus is on narrative and story and making you feel like you're part of a big cinematic adventure." And, to be honest, if you are fighting against robots and leaping over minefields in New York City like you do in Enslaved, then watching Seinfeld reruns in three dimensions isn't high on your list of priorities. If you're interest in how the rest of the game plays, check out Susan Arendt's review of Enslaved.